The miche is particularly appealing, though I wouldn't turn any of them down if offered! 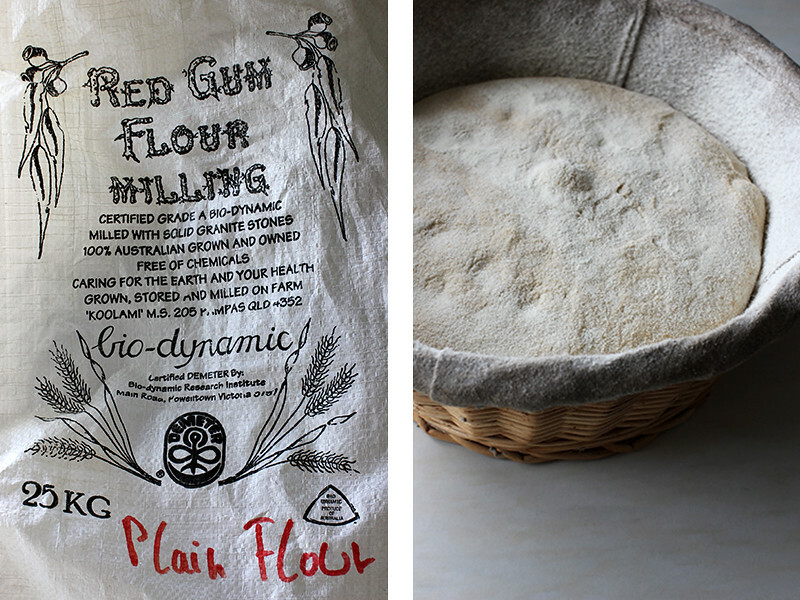 I'd love to get my hands in the Red Gum flour. 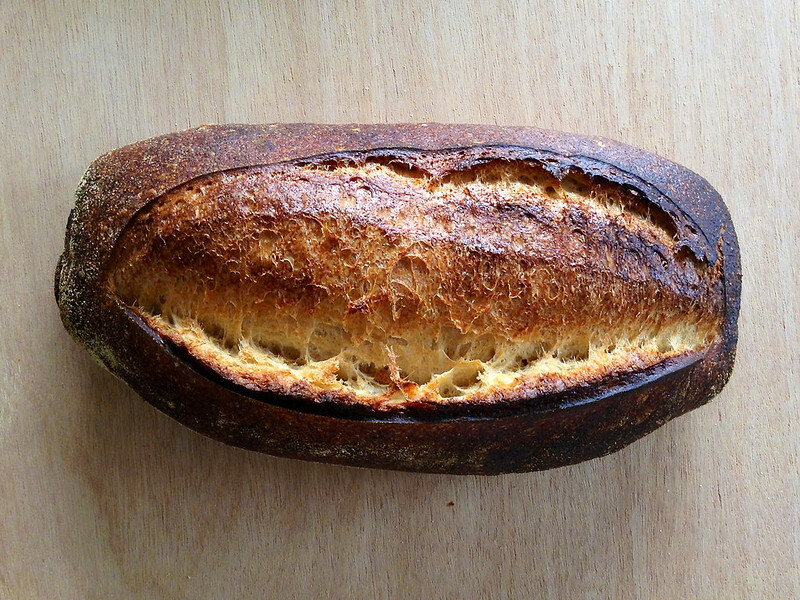 It makes such a lovely loaf, as attested by your photos. Any ideas about what may have caused a bit of compression of the spelt crumb in the zone nearest the tin? The spelt compression only seemed to be right in the middle of the loaf where I cut it for the photo ... doh! ... Perhaps a proofing issue ... I will need to bake it a few more times to get a feel for it. Overall the crumb feels pretty spot on ... I am also having a few oven issues at home which may also be a factor ... I am investigating. 1. Where do you get your spelt berries? 2. 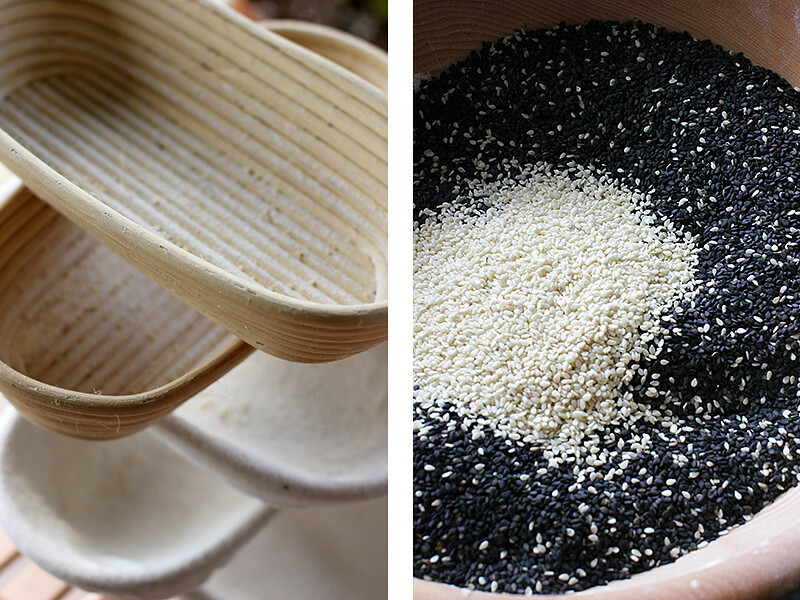 What setting do you mill with for bread flour on your Komo? I have been very lucky with the lighting ... we have had overcast and rainy conditions for the past few weeks ... luckily every time I pulled out the camera I had a break in the weather. What is your technique for crusting the loaves with sesame seeds? 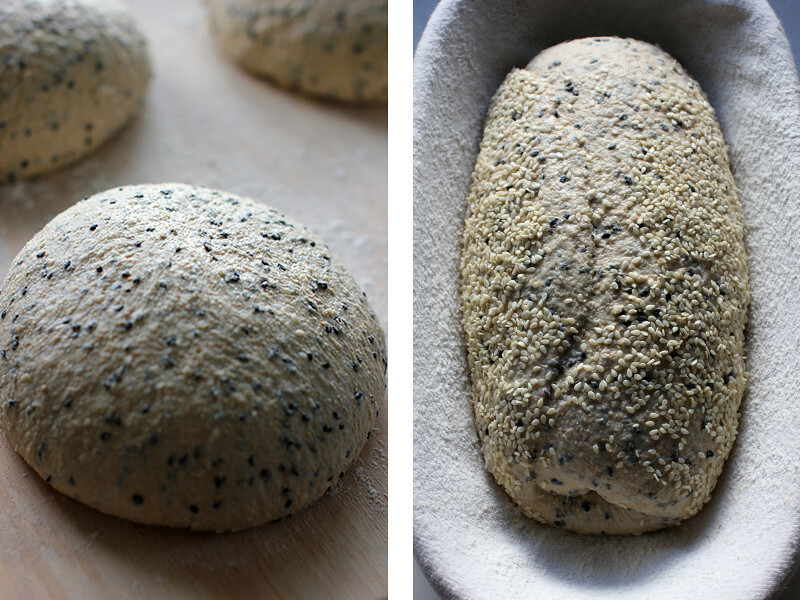 I simply rolled my shaped dough in a pile of sesame seeds carefully. Perhaps there's a better way to evenly coat a large area of loaf? 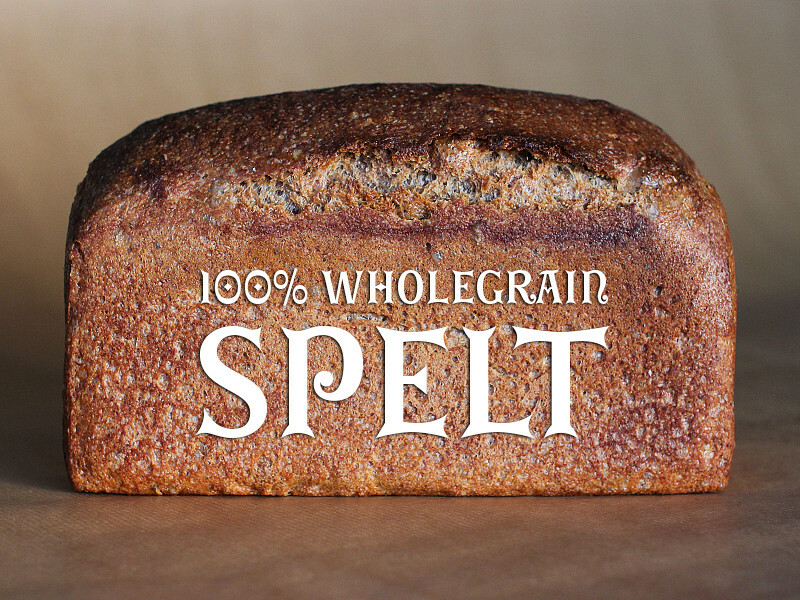 Love the idea of a 100% spelt loaf. I want to try that one. My techniques sounds the same as yours, though I do roll the shaped dough piece on a damp cloth/towel before rolling in the coating. This helps the coating to stick. Give the spelt a go ... you may need to reduce the hydration depending on your flour. I forgot to mention that I give the loaf a light mist of warm water prior to rolling in the seeds. It seems the damp towel trick produces better results. Thanksfor sharing. Just gorgeous Phil as usual. I have missed the toadies bandwagon ... we had the sesame wholewheat toasted with scrambled eggs this morning ... GOLD! bake! It will have to be a 100% whole grain; wheat, spelt and farro with Toafies and ground flax and sesame seed SD adn nYW bake at a higher hydration for a tinned samdwich loaf. Think we will sift ouit the bran for a sclad/soaker with the Toadies and seeds. That way we can autolyse the extracted flour for a couple of hours and slap & fold it to develop the gluten. Then we can stretch and fold the bran/toadie/seed seed scald/soaker into the mix later without damaging the gluten too much. Certainly your happiness speaks out of that spelt crumb! I definately had a smile on my face when I sliced open the spelt bread ... very pleased. Just lovely everything, bakes, photography, scoring and your post all wonderfully good. So is the flour available for sale anywhere around Australia or do we have to come across to Queensland ? Queensland seems to have turned out some outstanding bakers /photographers both yourself and Shio Ping who we unfortunately haven't heard from in a long while. 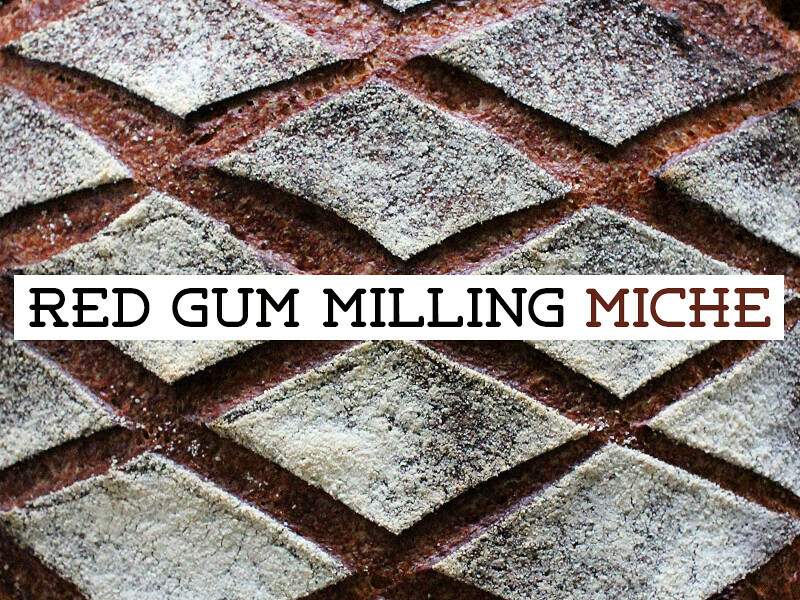 I have not seen the Red Gum Milling flour anywhere apart from an organic market a few years ago. I think Barry is just milling for his clients requirements. I am honoured to say that Shiao-Ping was a customer of mine during my brief stint at Chester st ... I have never been so nervous selling a loaf of my bread as I was that day. I hope to keep in contact with her when I get started on my next chapter. I remember reading your post saying that Shiao Ping had been a customer at Chester St and i thought then it would have been great getting critical acclaim from such a notable source. Living in the same city would be to big an opportumity not to have occasional bread swaps, i have promised to bring over a nice red for her husband when i finally visit the other side, not a Margaret River red but a shiraz from Frankland in the Great Southern Region probably a Harewood, a winery at Denmark (WA) who sources most of their Shiraz grapes from my cousin's vines at Frankland, something that is not widely available!. Art, and science couldn't be any happier, Phil! you have managed to mingle those two into perfection. I love that spelt loaf to! Candidate items for the hopefully-someday-to-be-opened Brisbane bakehouse Phil Mills? Picture pretty as ever. And thanks for the formulae/processes too. 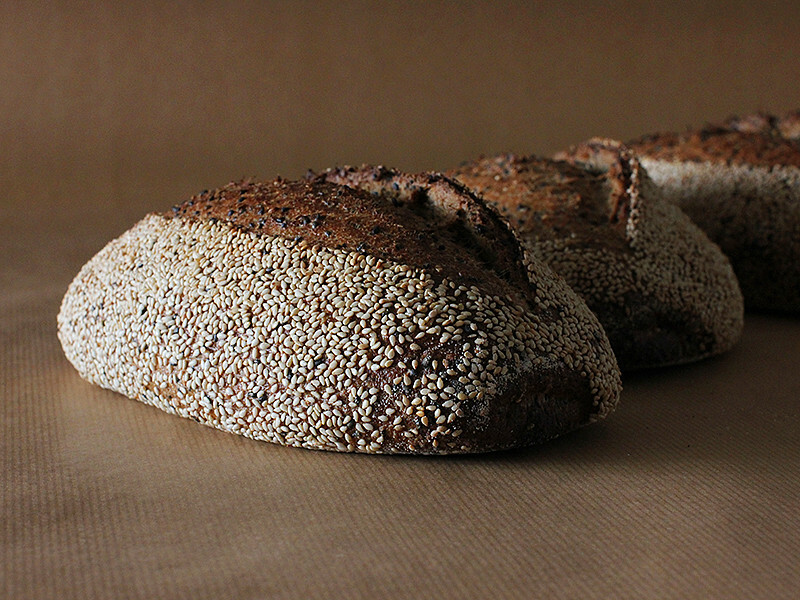 Would absolutely include the sesame and spelt breads on the bread list! 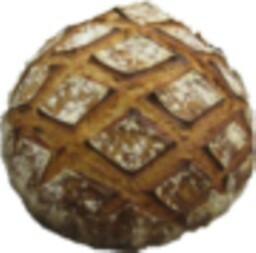 is it really possible that your breads get better with every post? Wondering what difference you find in doing your short autolyze? 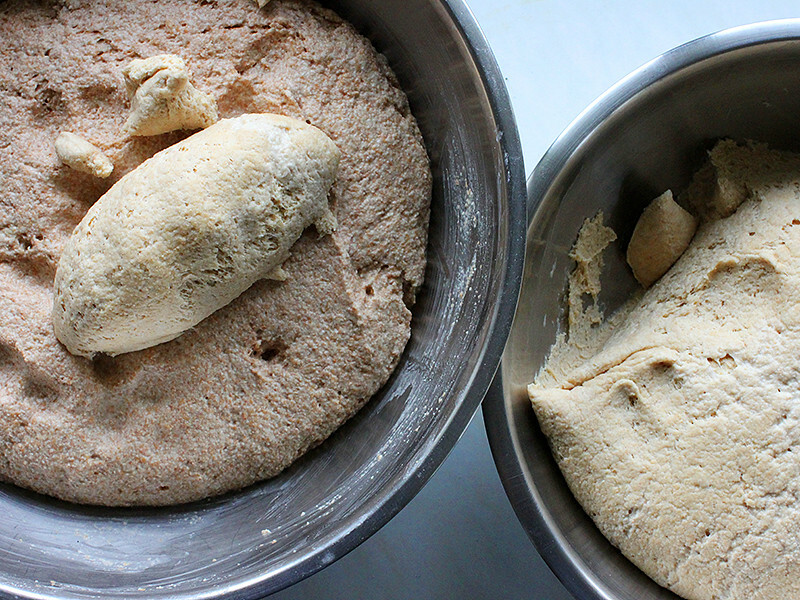 I use a DLX to mix my doughs initially and, due to it's design, I have to add my leaven to my auto. time so it technically isn't an autolyze but I then add all the flour (salt in the summer time) after-which it then sits for an hour prior to additional ingredients being added. I let it sit primarily for the gluten development. Dough needs less kneading time following this time plus it allows me to determine if I need to add more flour or water as a final adjustment since ww takes longer to absorb the liquids. 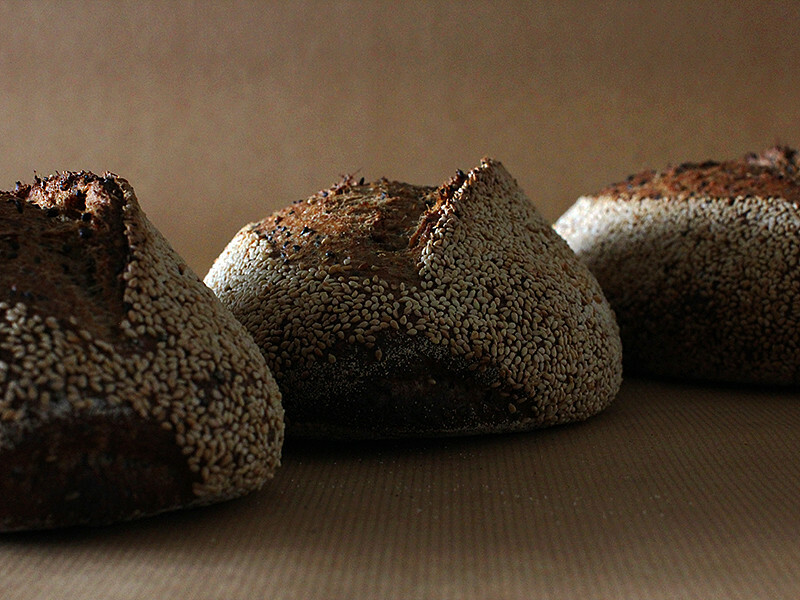 Love your photos as always and the loaves are outstanding. The bar has been raised once again. P.S. I am continuing to practice with bold bakes and all of the people I give bread to are responding with resoundingly positive remarks about the results so thanks for the 'shove' in that direction. 20% levain is working nicely ... I try to keep the dough temp spot on and it goes straight into the fridge after mixing. This should work nicely in Summer also. They way I look at the autolyse for these breads is just for initial water absorption. If they are going to spend 15 hours in bulk then I don't see the benefit of a long autolyse before hand. I use a short autolyse just to make the intial mix with the levain easier. I always autolyse without the levain. 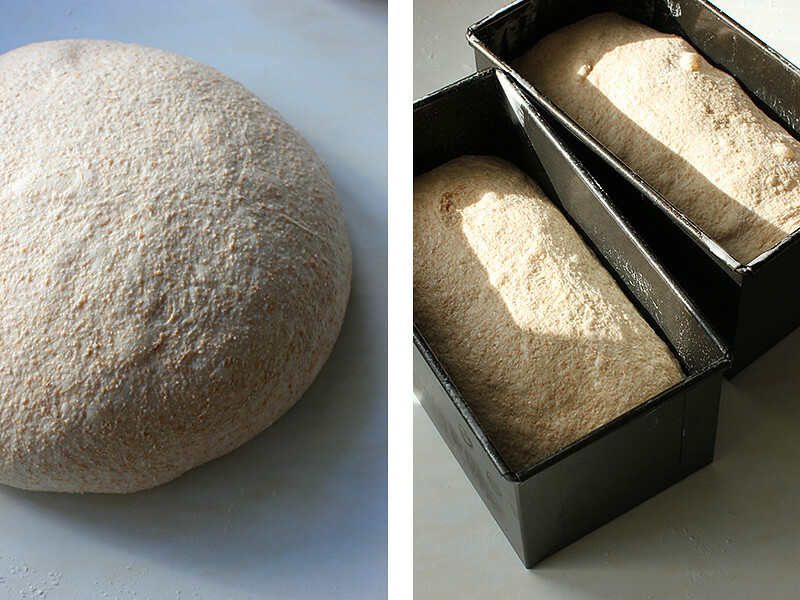 These are not the easiest of breads to mix by hand and it is hard to feel the strength developing until they are folded in bulk. Glad to hear you are baking a bit 'bolder' ... so much flavour to be found there! So now I ask why you jumped the leaven up to 20% with whole grain bakes? I know in the past you were using only 13% at times with your 'old' bakes that included sifted ww. Only thing I can think of is that you have increased it to add strength to the dough due to the high hydration levels you are using in these loaves. Or are you doing it for the extra flavor it imparts? The increase in levain is due to the harsh cold conditions of my fridge ... If I had slightly more control over the temps I would probably decrease this. Your also right about the strength factor, but I keep the builds so short I am a little doubtful about how much effect they would have in the short term. The long duration in bulk makes for this. At 100% HL I have to ask how on earth you handle the dough in the morning since, with lean doughs, they do get slacker as they ferment overnight - at least mine do. At that HL I am afraid I would get loaves that I have labeled my 'Frisbee' loaves - flat....Only time I go that high is when I add dried fruits that I don't soak prior to being added to the mix. I work quickly when the dough comes out of the fridge. I don't let it come to room temp and find it is reasonably easy to preshape. I use the "scraper in the hand" method that you may have seen the likes of Chad Robertson using to round the preshape pieces. I round them pretty tight and then let them relax for 30mins/for up to an hour ... I am looking for the dough to start pancaking. Then I shape ... and you have to shape tight. That's probably the hardest thing to explain with text on a screen .... I want to see lots of tension in the dough so I know that it will spring and open up in the oven. If you are happy with your dough there may be no reason to increase your water content ... and if you do, perhaps just increase it by 5% increments. Shaping while still cold made it very easy to do. Not sticky at all though I did have to work to get it to hold it's shape. Interesting in that my loaf has the same tin line yours has. I am thinking that is due to being too determined to shape it tight so I took it a bit too far.... I baked 4 loaves and not all did this so who knows. A bread mystery. All did spring very nicely in the oven. My temps. were a bit lower than yours. I did start out at 475° but dropped down to 375° after 10 minutes and then down to 350° after 15 minutes. Just wasn't sure how my Cadco would do and I know you have said your oven leaks a lot of air.....I could have stayed higher and I could have put the loaf back without the pan for awhile too to get better color throughout the loaf. 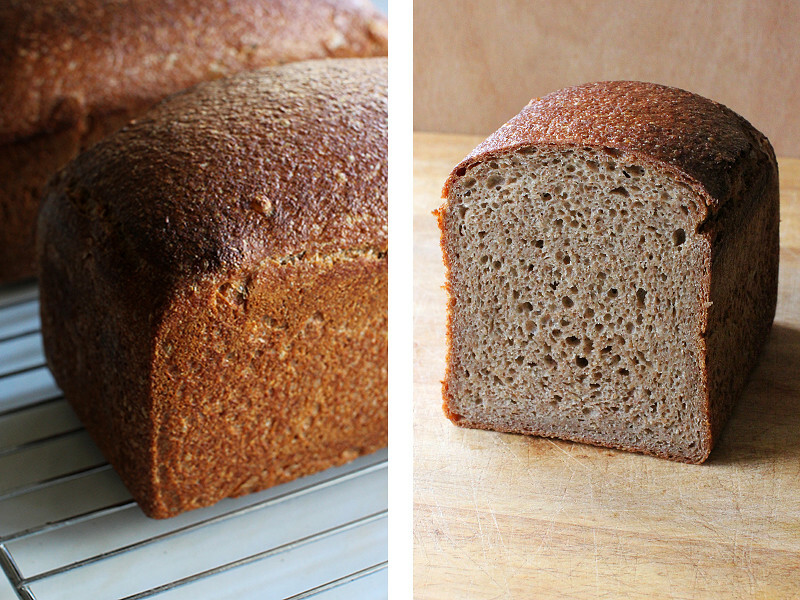 Like you I love the golden color spelt creates. Really lovely looking loaves. No crumb shot until someone here cuts into the loaf I am keeping for us but no one is here and who knows when that will happen so I am posting just a loaf shot. Thanks for the inspiration to bake with the HL higher. Wasn't as frightning to do as I had imagined. My last and only attempt at doing this was when I just started baking and knew nothing at all. I tried an overnight bulk with spelt with high HL and woke up to complete goo the following morning. 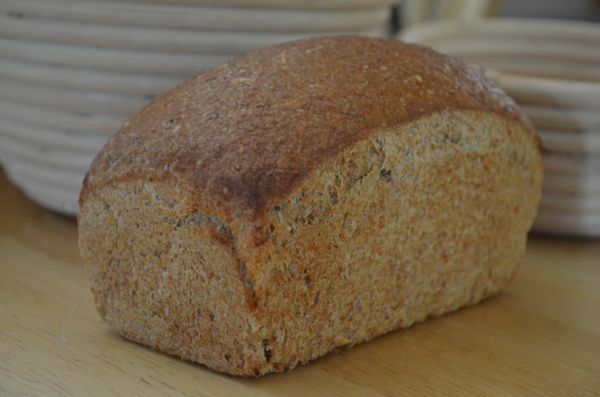 Since then I keep my HL in most loaves below 80% unless there are add-ins that absorb water. This looks amazing. I am curious if you also use freshly milled flour. I don't have a mill and am wondering if I can acheive similar results with store bought flour. As I read through your post, scrolling down through the photos, it's like turning pages in the most beautifully-produced bread book I've ever seen. 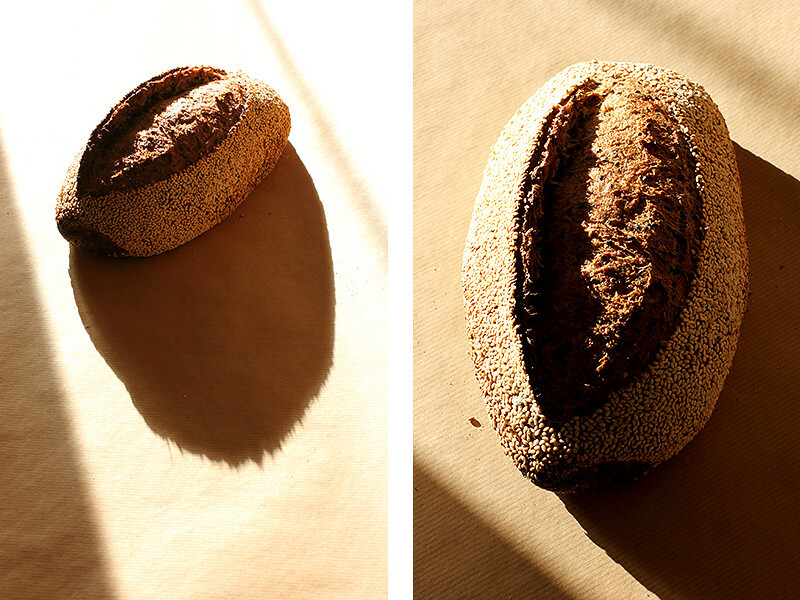 The breads are stellar, and grateful that your photos capture them; your writing captures the background - where the grain came from and how the bread was made. lovely.. as always. just curious is it 100% hydration in both dough? Yep that's right ... Both the wholegrain breads have a final hydration around the 100%. Those loaves looked beautiful and delicious. I can imagine how delicious when scrambled eggs are on sesame toasts. 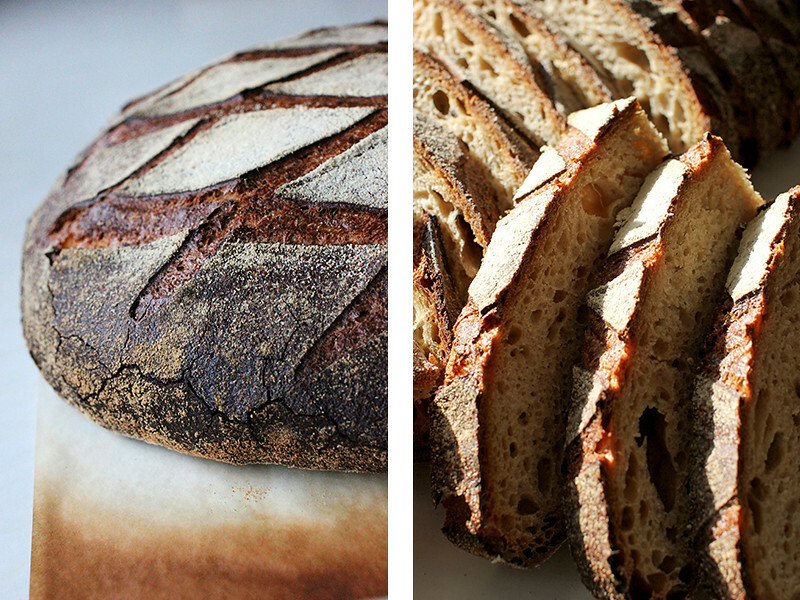 These breads are definitely on top of my baking list. I still haven't decided whether to get the flour mill so I will use Four Leaf's 85% Light Flour with 80% hydration as usual. Since there are lots of sesame seeds in the dough, is that the reason, apart from the freshly milled flour being used, the dough required 100% hydration? Your pictures are magnificent as usual and thanks for the formulas. I have noticed a big leap forward in the quality of my wholegbread baking since following these ideas. I think I will have to practice on very wet dough more often if I want to bring my bread to the next level. Of course, I have to freshly mill the flour too. Look forward to reading your new post. Beautiful, Phil. May I feature your post on the homepage for a bit? What an outstanding bake! All are superb...I'm unable to pick a favorite. Thanks for sharing all with the added plus of your gorgeous photos. I am hard pressed to pick a favourite also ... They are all delicious!!! 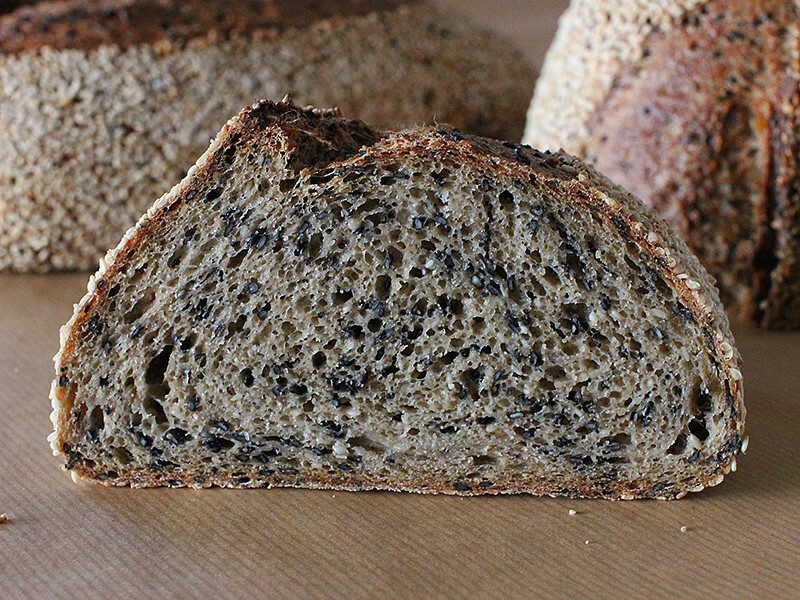 I agree the toasted unhulled sesame throughout the loaf really brings great flavor as I made a Sesmae sour (didn't look this good) as one of my Farmers Market bakes. I didn't coat the outsides in seeds as I had none left but I thought it would be super cool to have a line of seeds right where the ear would raise off the loaf. That would take precision as for putting them on and a perfect score. Much easier to just coat the whole thing. I guess this guy out in Chico has you inspired to work with very high hydration doughs. I gotta go check out his bread. Well what can I say that hasn't already been said?! Absolutely cracking bread mate! 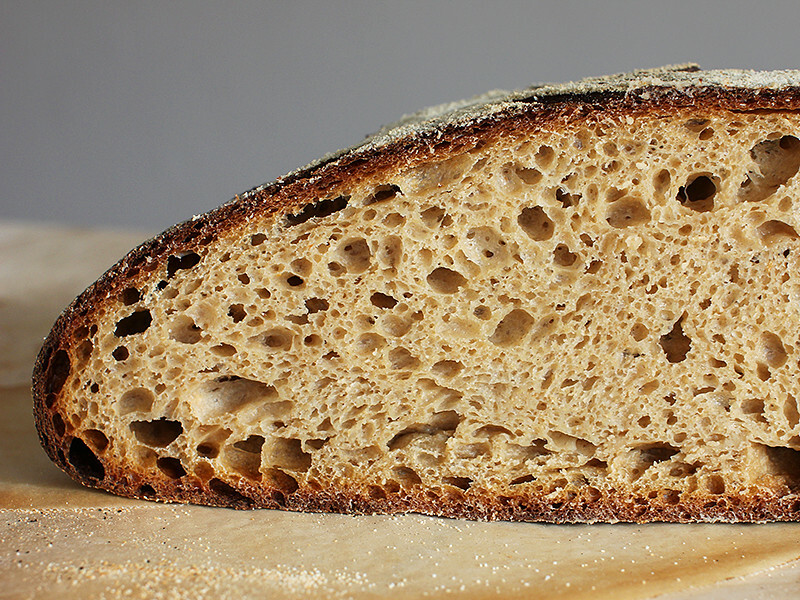 I myself have never cared to try a Miche, but that crumb looks bang on, I might just have to give it a go! "I am continuing the practice of retarding the wholegrain dough in bulk. 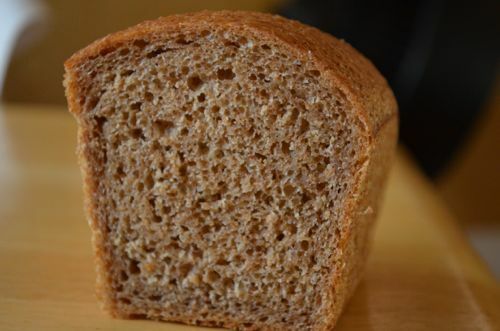 Not only does this control the fermentation, but it also allows for an extended ‘wet time’ … this is always a good thing when baking withwhole grains." What does the long bulk retard do to the flavor? It's not too sour (the nemesis of whole grain)? The biggest trick is getting the dough temp right so it is fermented to the correct point by the next morning. Those loaves look amazing. Just spectacular. 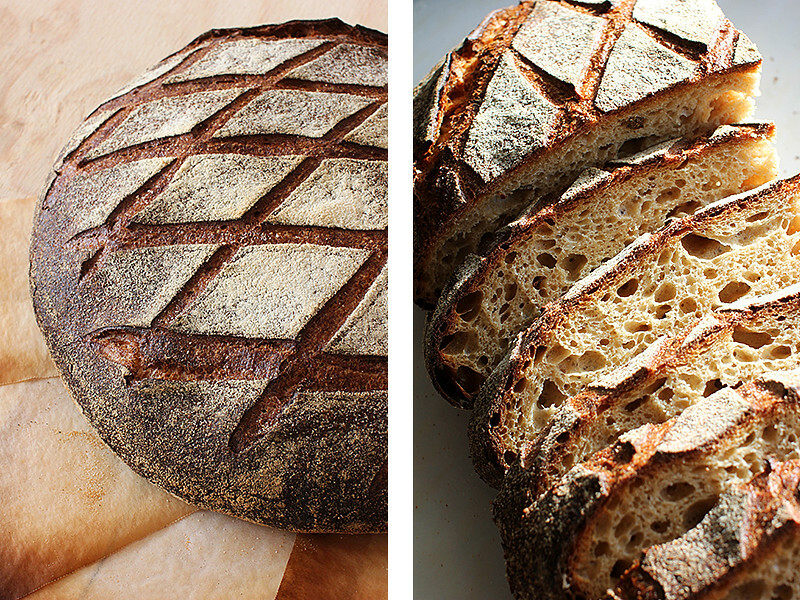 The miche had such a beautiful crumb color. how do you transfer the final dough from the basket to the baking pan? When I do it, the dough collapses and there is not enough of an oven spring to bring it up again. 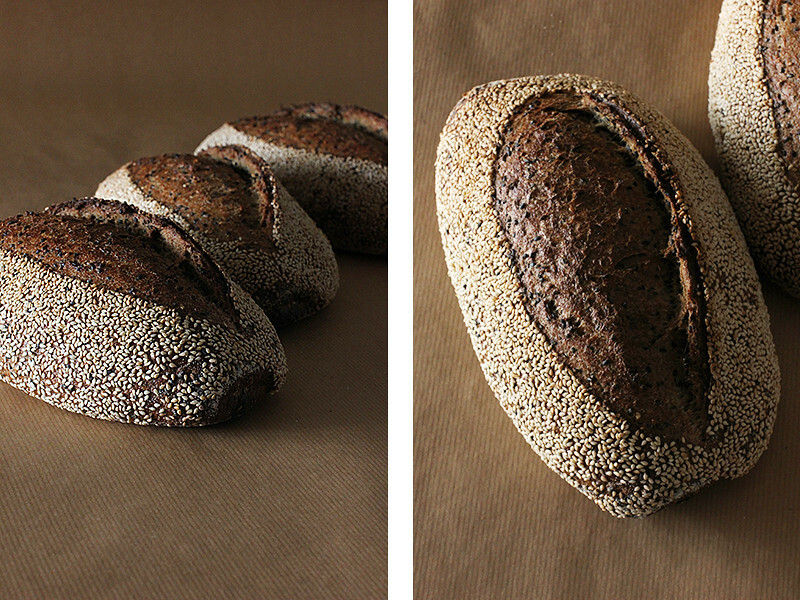 Do you bake the sesame whole wheat on a baking stone or in a clay vessel?